This project consists of the development and demonstration of advanced inverters with standardized functionality and an open communication interface that can meet the requirements of the new California (CA) Rule 21 interconnection guideline. The communication interface will utilize the IEC standard information model, the SunSpec protocol, and the CEA-2045 modular interface to enable off-the-shelf inverters to be mass produced, and compatible with any SCADA, AMI, or other system. 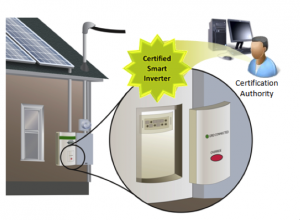 The project will also develop a certification test program, including the test procedures, software, and facilities needed to validate that new inverter designs function and communicate per the standards. A certification process is a must-have because standards alone are not sufficient to produce interoperability. The certification process will be based on the California Rule 21 requirements, and will include testing of both the power and communication interfaces of the inverter. In this way, the inverters could be fielded immediately, with confidence that they could be successfully integrated with control systems at a later time, if and when needed. The project, which is led by EPRI, includes the SunSpec Alliance, Southern California Edison (SCE), Sacramento Municipal Utility District (SMUD), SMA, Fronius, Sandia National Laboratories, Underwriters Laboratories (UL), and Xanthus Consulting. This project team includes organizations that are providing industry leadership in the relevant areas and are uniquely suited to carry out these tasks. Sandia National Laboratories is leading the development of inverter test procedures that ensure proper implementation of smart inverter functions. These test procedures will be supported by communication software produced by the SunSpec Alliance. UL will utilize this software to develop a test facility that is capable of complete compliance testing. Inverter manufacturers Fronius and SMA will produce inverters that support the advanced functions and communication interface. These inverters will be tested in the facility at UL. EPRI is working with SCE and SMUD to produce communication modules that are compatible with their communication systems. These modules will be tested with the inverters in laboratory environments and in the field. The duration of the project is 24 months and includes 4 months for initial design engineering, 10 months for development of open source software and demonstration hardware, and 10 months for testing and demonstration.